September is here with its shiny new satchel of optimism so what better day to start something new: A Year of Less Spending. From today September 1st 2015 until 31st August 2016, I hope to track all my spending and spend far less money than I have in the last twelve months. It's not a total shopping ban as I don't want us to completely go without nice treats. I don't believe living with less means having to go without your favourite things, it just means having them a little less often. Over the last few years we've got much better at managing on a smaller income whilst still enjoying a comfortable but simple life. We've learnt to live with what we've got and make things last (my husband has only ever owned one mobile phone and it's still going strong). We're fortunate to have no debt other than a small mortgage, no credit cards and modest savings/pension provision. However, despite improvements in my shopping habits such as keeping my grocery shopping more consistent, I still overspend especially when life gets busy and I'm tired. Then convenience becomes more attractive than saving money. And despite having minimised my wardrobe to forty pieces last year I've added more pieces to it than I'd planned. Convenience shopping and clothing are still my weaknesses. When I add up my incidental spending over the last twelve months it shocks me how much money I'm still wasting. Spending less money on my hair over the last year has shown me that I can stick to a challenge. Not dyeing my hair, using less shampoo and cutting my own hair with only occasional salon visits has saved me a fortune (probably more than half of what I previously spent). Now I need to apply this mindset to spending less money in other areas. How many times during the next twelve months will I be tempted to buy wants such as flowers, magazines and charity shop finds? How many times can I resist the lure of my nearby lux eight letter supermarket for the four letter supermarket that requires driving through town but whose receipts ring joy? This is what I'll track and share with you during the next year. Having less income requires careful management, especially when it fluctuates like my earnings do (I work supply hours as well as my permanent hours). From today I shall be back to keeping a spending diary and trying to spend less. There'll be more time spent planning frugal meals and cooking from scratch. I'll try paying with cash and staying away from shops/advertising/online browsing (where we all know the temptation starts) as much as I can. My aim is that by keeping a spending diary and by reducing costs we'll be able to save for more fun experiences and some sort of summer holiday next year. I'll be able to make a few considered purchases to update my small wardrobe and start saving for bigger future expenses such as a living room revamp and travel plans for my 50th birthday/our 25th wedding anniversary. Above all I hope to reduce my wants, adequately provide for our needs and build savings to help realise our long term dreams. One thing we've certainly found is that a higher income doesn't make us happier. As I've written many times we value time together over earning a high salary because of the hidden costs to our health and family life that we experienced when I worked full-time in a management role in teaching. Living with less has made us appreciate all that we have and they're not just material things. It also makes me more aware of how easy it is to waste money and how uncomfortable excess consumerism makes me feel. 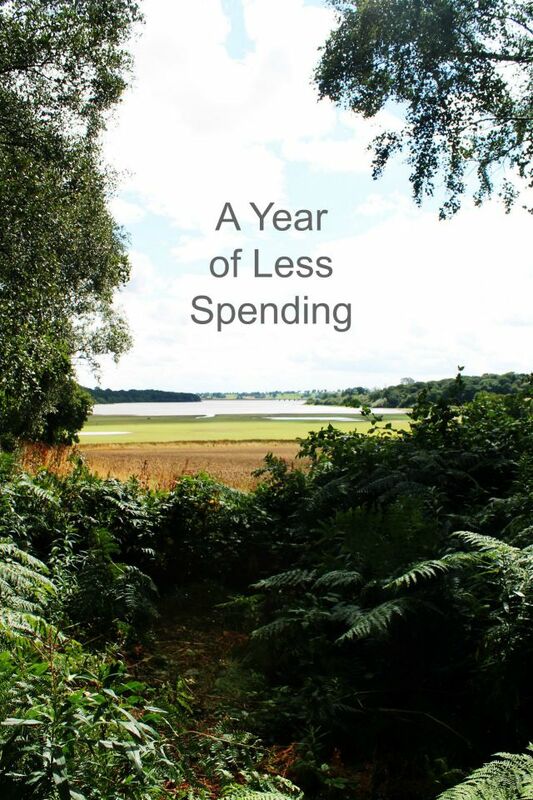 A Year of Less Spending is a balanced approach to minimalism and materialism. At the end of twelve months I hope to be more accountable for my spending, to have had some great experiences and to have acquired more savings than impulse buys. This sounds brilliant and I'll be following your progress with interest. It strange this September, it really feels like a new year and a time for new beginnings even though the real New Year is still four months away. So it's very appropriate that you should start your challenge now. With you all the way on this! I too waste money on wants - a charity shop purchase here, a sale item there!! After a good wardrobe clear out with eBay sales and donations I'm afraid it's now bursting with clothes again! So unnecessary. Food is much along the same lines too. We are determined to be more mindful of our spending. I love September. Think it comes from our 3 children starting the new school year in the past, new beginnings, etc. Autumn is also my favourite season. I always seem to take stock of things at this time of year. I look forward to hearing about your progress, and also about which items you feel are worth spending on. I agree with Sue, September is definitely the best time for new beginnings - I think I'll join you - like you, business has lead to less wise shopping choices, particularly with grocery shopping. I look forward to following your progress. Great idea Clare. I'll be interested to see how you get on. We did this many years ago, and it made all the difference, enabling us to pay off our mortgage early and then save. Which in turn has helped us help our (now grown) sons through training and house buying - not something most young people can manage alone these days. September/October really IS New Year for me, as a Jewish woman - feels very appropriate! I'm interested and happy to see I am not the only one who considers September the start of a new year. I have managed to live more simply in recent years and find myself slipping off the 'simplicity wagon' from time to time. Clothing, cosmetics and food are my weaknesses. Having just been told I am pre diabetic will go a long way to improving my diet and by extension my food shopping habits. Clothing and cosmetics are harder, but I do have a one in one out rule, unfortunately I seem to have a revolving door on my closet at the moment. I guess we are all works in progress, and can only try. I shall be following your progress and trying to bring my own habits in line, beginning today. I'm glad I am not the only one who struggles. My spending is starting to increase again, I had done so well until the last month or so. My weaknesses are clothes, magazines and kindle books. When I'm busy I tend to treat the local M&S food shop as a corner shop. Thanks for helping me to refocus. This year I have been trying to live more simply and frugally with quite some success, but I too find it hard when life becomes busy and I'm tired. Your post has come at the right time for me, I am going to reduce my spending and track my expenses. Good luck with the next year of reduced spending. I totally agree that our spending often increases without us noticing and then becomes the norm. September is a great time to start a new habit. I usually try to start new habits on 01 January, but, today is better! Tomorrow is my 68th birthday. I work full time (small business owner). Even though I am employed full time, My retirement saving account is very meager. I have made a new resolution to start living like I am retired on a small budget and save everything else. I am dejunking my house, "touching" everything in it, and asking "do I need this, does it make me happy, etc?" The less I have, the happier I am. I am wishing all of us "Good Luck" on our 12 month journey! I'm joining you on this one. Although I consider myself pretty good at budgeting, this summer my spending has crept upwards & I need to rein it in. If it's a want, not a need, I'm not buying it & I'm going to stop the mid week grocery top up(s). Hi Claire. Looks like alot of us will be joining you...definitely I'm in. I agree about September and new beginnings. My weakness is definitely books and magazines. Books being the hardest and I use the library alot. I need to reduce my food bill too. A habit I get into enthusiastically and break over time without realising it. Love reading your blog and will be following this with great interest. Good not to feel alone in these challenges. This looks really interesting, I'd love to read about how you do this! I really do hope this goes well for you. You can do it for sure but don't beat yourself up if you have the occasional slip up. Best of luck and I'll be watching your progress. I shall be watching with interest. I too have been trying to spend less, but combining a minimalist approach with an eco aware one isn't always the cheapest way to live I'm finding. Just don't deny yourself everything - sometimes buying flowers can really lift the spirits. I can do without a lot of things, but not flowers in the home. A nice bunch, with greenery from the garden, can be spread out as posies or instead in one vase for a spectacular display.